While in London in November I couldn’t pass up the opportunity to return to Borough Market, that vibrant hub of diverse food artisans that provides a plethora of tantalizing food options to locals and tourists. Since my visit to the UK involved participation in a conference devoted to reducing food waste and greening the cold chain, I decided to do a little on-the-side research in London on my own. Having been to Borough Market once before, I knew of the great selection of myriad foods from local producers — but I was excited to learn more about the Market’s role in the community and its commitment to “doing good” in many ways, including through donations of perfectly good, excess food. Thanks to a helpful staffer and Borough Market publications, I learned a lot. Some quick background. Amazingly, especially considering the extensive consolidation that has occurred among food retailers, Borough Market has a history that dates back one thousand years. The Market has survived all kinds of disruption and gone through considerable evolution to reach its current status as a thriving food mecca. But as the Market’s website suggests, it is much more than just a location to buy and sell food — it is unique. Part of Borough Market’s unique nature stems from its structure. It is a charitable trust dedicated to providing a market to benefit the public. It is a dynamic venue for people to celebrate and connect over quality food, to share knowledge and expertise, and to create partnerships “that inspire people about food, creativity, and sustainability.” In short, Borough Market is about community. Its directors seek to make it diverse and accessible to all community members while working with new businesses and social enterprises to ensure its long term viability. While it is a food sector entity, Borough Market provides a number of valuable lessons for individuals and organizations engaged in corporate social responsibility and sustainability initiatives across all sectors. First, the Market’s very longevity shows its ability to adapt to changing external and global conditions. Second, Borough Market’s ability to manage hundreds of diverse stallholders with myriad products and differing priorities, coupled with an incredibly diverse customer base, demonstrates recognition of the value in creative tension and the importance of managing it properly. As Board chairman Donald Hyslop noted, “everyday it should create dilemmas…if it didn’t, you’d be doing something wrong — you’d be uniform, regimented.” Viewing the market as its own mini-system in the larger food system, there are lessons here for those seeking to create positive change at the global level — such as feeding nine billion in a way that preserves the environment — by focusing on shared goals (ex. reduced waste, reduced pollution, enhanced safety, reduced hunger) and viewing challenges as opportunities. Organizations that fail to evolve, that avoid responsible business practices, and that seek to avoid the tension brought about by change (particularly related to sustainability) not only miss an opportunity for competitive advantage, but increasingly they risk surviving. Responding to critics who say that the Market is “not like what it used to be” (i.e. it is too expensive, and too crowded with tourists), Hyslop noted that it is “better to have that challenge than one caused by no people coming at all.” Some lessons for organizations: be accepting of globalization (in this case represented by increased tourism) and look for ways to make money by incorporating sustainability into your business model. The global food system is arguably the most important “system” on the planet, and as a result it naturally harbors opportunities for all types of organizations. Borough Market’s governing directors recognize the importance of dialog about food and the food system, diet, health and wellness, sustainable agriculture, and increasing urbanization. In fact, they recognize the role of the Market amid the challenges of the global food system, and they want the Market to play a role in the dialog. Toward that end, they have sponsored talks and debates on the future of food to tap the knowledge of various thought leaders. 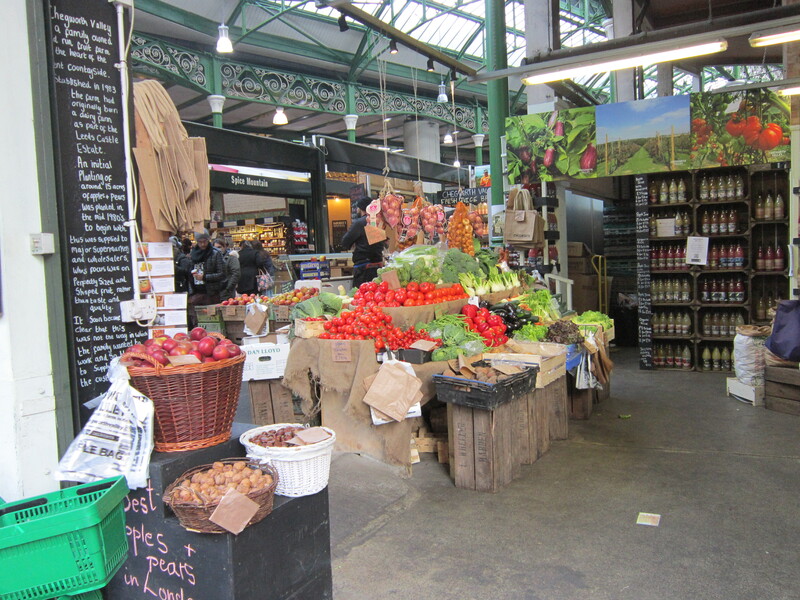 For example, Tim Lang, City University professor of food policy and Market trustee, pointed out several challenges that will shape the future food supply in Borough Market’s “Market Life” publication. In speaking of the impact of Agriculture, Lang noted that it is the largest consumer of the world’s water, it is the largest contributor to greenhouse gas emissions, and it consumes huge amounts of land while contributing to soil erosion. He pointed out that “we should not wait for some crisis to kick in before redesigning food systems to have a lower impact.” Well said, and a lesson for all of us (consumers, businesses, NGOs, and governments alike) as we need to determine how to feed two billion more global citizens in a sustainable manner in just 35 short years. Lang also pointed to the wealth gap in the UK where the rate of increase in food prices has outstripped wage growth, making healthy foods such as fruits and vegetables increasingly out of reach for many. This problem is shared in the US and other countries and is exacerbated by the lack of physical access to retailers with high quality food, resulting in food deserts. The result is a serious increase in diet-related illness such as diabetes and obesity. In keeping with its goal of helping community members, Borough Market has addressed this problem by partnering with Food Save and the Sustainable Restaurant Association to capture excess food — perfectly good food that would otherwise go to waste — and donate it to organizations serving the needy. At closing time on Saturdays, various Borough Market traders contribute leftover fruits, vegetables, and other food items to charitable organizations waiting to pick them up and put them to good use. These organizations include groups such as Plan Zheroes, which is dedicated to “find, support, and inspire food businesses who are willing to donate their surplus food to local charities and people who need it, and promote them as Zero food Waste Heroes.” Such efforts are a start in the effort to reduce the 7 million tons of food waste occurring annually in the UK according to WRAP. They provide many individuals with high quality calories from fruits and vegetables that they often struggle to obtain. There are related benefits to these food donations as well. Another organization, the Mental Fight Club, captures the food for the Dragon Café, where it is made into low cost meals each Monday in a setting which provides companionship and other services. There are clear wins for multiple stakeholders here. Traders avoid disposal costs, hungry people gain access to high quality food, the environment benefits from reduced landfill deposits and greenhouse gas emissions, and the Market promotes the concept of community. And thanks to Borough Market, there are also great lessons for individuals and organizations interested in positively impacting the food system to reflect on for the New Year.